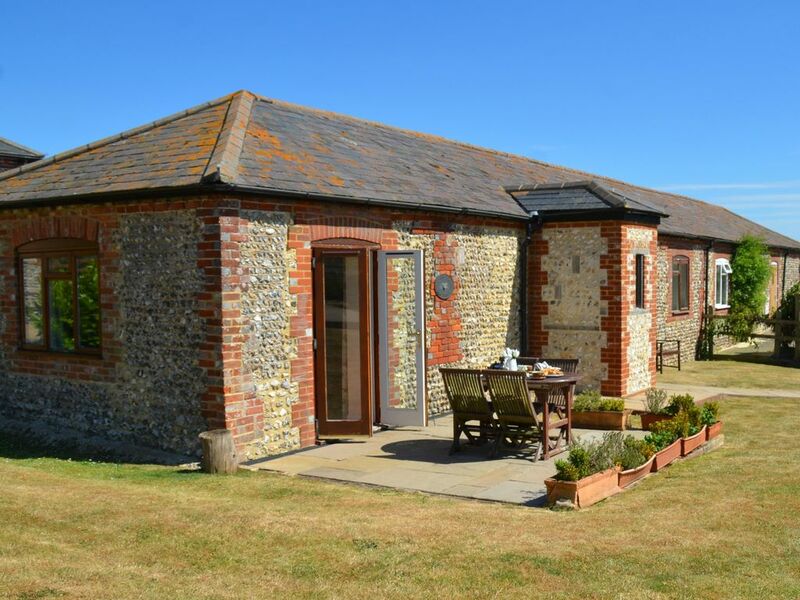 This farm building conversion set in the South Downs National Park is a wonderful holiday retreat. Walnut Tree Cottage has an open plan living area with a cosy lounge area, dining table and a fully fitted kitchen. The kitchen has a full oven, hob, dishwasher, fridge/freezer and washing machine available. There is entertainment provided with Freeview television, a DVD player, games and books. The double bedroom has a kingsize bed and an ensuite bathroom with a corner shower, WC and basin. The second bedroom is twin bedded and is served by the family bathroom which has a bath with a shower attachment. There is a lovely patio area which is accessed from the lounge and has an outside table for four with uninterrupted countryside views. The garden is fully enclosed and there is plenty of parking available to the front of the cottage. A charge of £25.00 per stay or per week, whichever is shorter, will be made for each dog (guide dogs for the blind and registered assistance dogs excepted). Please let us know if you will be bringing a dog with you. This property will accept a maximum of two dogs. Patching is a quaint village centred along “The Street”. At the top, as the lane climbs towards the South Downs, is the church and beside that the Walnut Tree Cottage. Take the downland paths around the woodland of Angmering Park and you reach the attractive villages of Wepham and Burpham three miles to the west. Like Patching they lie at the foot of the Downs and are frequented by walkers. The George and Dragon a traditional English country pub set right in the heart of Burpham is worth visiting and is hard to pass by when enjoying a walk to Burpham! Just across the Arun valley from there is Arundel, a historic market town dominated by the symbolic castle and the rising spire of the cathedral. It offers plenty of craft and antique shops as well as restaurants and tearooms. It’s a great place to wander and just enjoy its hospitality and Arundel Castle, the seat of the Dukes of Norfolk, is definitely worth a visit. It is a short drive to the coast and both Climping Beach and Littlehampton's West Beach are only a short drive away. Goodwood and Fontwell racecourses are nearby along with the cathedral city of Chichester with its excellent Festival Theatre noted for not only the quality of productions but also the fact many world premieres are featured as well. We found the cottage very comfortable. It was well equipped. Everything we needed. We enjoyed the location of the cottage. The two pubs in the village served excellent food. It was convenient for travelling to nearby towns which we enjoyed. The only reason for not giving 5 stars was that we had no heat or hot water from mid afternoon on Thursday. Beautiful barn conversion in lovely rural location. We found this to be excellent holiday accommodation in a peaceful village location. It is spacious and very well appointed with the benefit of off road car parking. Well positioned for discovering the coast and countryside of West Sussex, we particularly enjoyed exploring Arundel and Chichester, walking on the coast at Littlehampton and visiting the Roman Palace at Fishbourne. Thank you for taking the time to leave a review regarding your recent stay at Walnut Tree Cottage. I am so glad to hear that you enjoyed your stay, and the peaceful surroundings and countryside.